Promotional jump ropes are certainly one of the more novel promotional giveaway items! Make a statement and literally make your brand jump out with some of our wonderful branded jump ropes. Order some custom jump ropes from PromotionChoice.com today and get the whackiest and funnest jump ropes imprinted with your logo! Get your clients to notice you and your company logo or brand. Variety, quality, differing styles, different colors, cheap pricing, and unmatched lead times are the basics that PromotionChoice strives for whenever we sell any products. This is no different for our customized jump ropes. 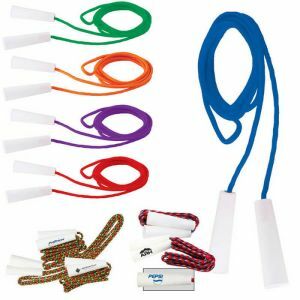 For those who are budget conscious, check our our "Fun Jump Ropes" - these come available in rainbow, patriotic red/white/blue, and also the basic solid colors of red, blue, orange, green, and purple. Starting at $0.79 each for blanks or no printing, these certainly won't break the bank, while still giving you the attention, the fun, and the presence at your events. People keep personalized jump ropes for a long long time, as it is reusable and a flexible piece of exercise equipment. It promotes a healthy lifestyle, and your customers will always remember you and your company logo whenever they use their print jump ropes. For a little more money, you can get our beautiful 10 feet logo jump ropes, that also come in the primary solid colors like green, bluem red, purple, and black. 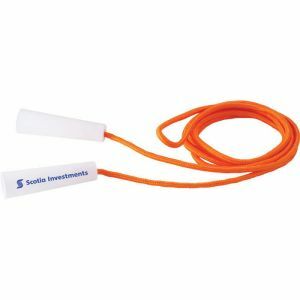 And finally, our most unique and highest end wholesale jump ropes are our calorie counter jump ropes (available in black, orange and blue). 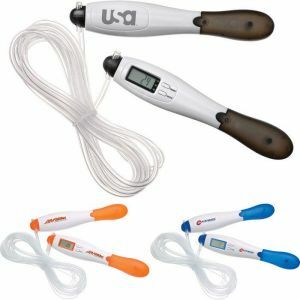 This particular imprinted jump rope helps you easily keep track of how many calories you have burnt while exercising! So get some of our gorgeous imprinted jump ropes today, and get your customers jumping into a healthy lifestyle. Remind them of their childhood when they used to play fun games like "Helicopter", "Snake in the Grass", "Zero-Point", "Jump the River", "Follow-Me", "Jump the Mountain" and many more. 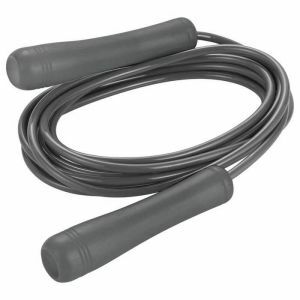 Jump rope alone, or jump rope in pairs, or even in a team, the options are endless. And best of all, you can virtually exercise and have fun anywhere where you just have a little bit of space. When your customers are happy and healthy, they will in turn, remember you fondly! We monogram your logo as large as we can onto the handles of the personalized jump ropes, which have generous imprint areas. They can either be printed on one side or two sides, and only on one handle or for a little more money, on both handes. We have thousands of happy customers, and Promotion Choice looks forward to adding you to our list of satisfied clients. 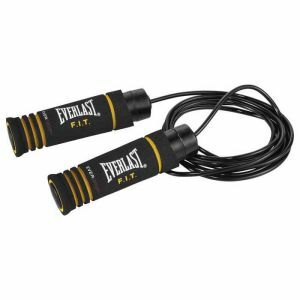 Get some of our custom jump rope today and make them work and promote for your business! Place your order, send us your artwork, you get a virtual proof (if you request one), and get your delivery in the mail a few days later after you approve your virtual proof. Once you receive the shipment of customized jump rope, be prepared to be really impressed with our quality and our print job! Then give them out and make your event attendees super happy and interested in your brand and perhaps even become customers for life! It really is that simple!